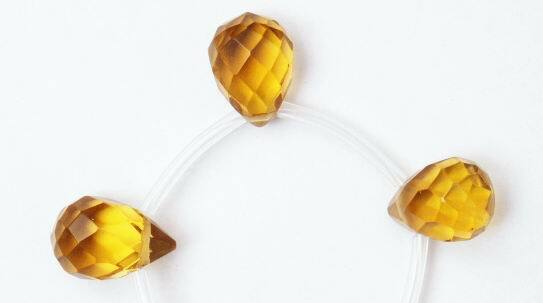 Price is per 16-inch strands of these beautiful faceted beads. About 16 teardrops to a strand. Each measures 12mm x 8mm. ”Citrine” comes from the French word for lemon, and is any quartz crystal or cluster that’s yellow to orange. The darker, orange colors were traditionally the best, but today people prefer bright lemony shades to mix with pastel colors. Citrine with man-made color tends to have more of an orange or reddish caste. Most natural citrine starts life as amethyst until heated in a molten state to change.